IPOH - Ipoh has all the ingredients for an ideal weekend getaway. Street food is cheap and delicious, the flight is just over an hour long, and the pace is laid back enough to come back feeling rested from your holiday. While the capital of Perak has often been overlooked in favour of its flashier neighbour, Penang, Ipoh is fast gaining popularity among Singaporean travellers. The former tin mining town saw its heyday during the tin-mining boom in the early to mid 1900s, but lost its sheen when tin prices fell in the late 1900s. In the past few years, however, a slew of boutique hotels and cafes have breathed new life into the once-sleepy retirement town. Street art from local and international artists liven up faded and peeling buildings, while coffee shops and eateries dating back to the 1950s help Ipoh retain its rustic charm. Budget carrier Air Asia will launch direct flights to Ipoh on Dec 2, with tickets currently on sale. And time-pressed travelers will be glad to hear that you can fly in on a Saturday morning, out by Sunday night, and explore the best of Ipoh with this 36-hour itinerary. Catch your first glimpse of limestone mountains as your flight descends into Ipoh. These peaks are more than a scenic backdrop for the city - some of Ipoh's most famous dishes rely on them. Rain percolating through the limestone creates mineral-rich hard water that is said to grow fat, crunchy bean sprouts; kuay teow made with the same water has a silky smooth texture I have not encountered elsewhere. One of the most well known places to try this kuay teow and bean sprouts is tourist friendly Restoran Lou Wong Tauge Ayam Kuetiau, which has a photo menu and ample seating in the heart of Ipoh's old town. It serves chicken which is lean yet tasty, fresh and crisp bean sprouts, and soupy kway teow - a comforting way to start your day. Entry to Han Chin Pet Soo is by appointment only, which is almost as exclusive as back in the late 1800s and 1900s when it was a gentleman's club for Hakka tin mine owners. The museum, which is housed in an old shophouse, was opened to the public in 2015. Guides take visitors on an hour-long route through the three-storey shophouse, which showcases the hardscrabble life of miners in the 1800s and 1900s. It was not all hard work during those years. On the second floor, mannequins lounging on opium beds or seated at gambling tables depict an array of vices from that era. There are even waxen, cheongsam-clad ladies in waiting. "Kept women," states our guide matter of factly, adding that rich men would usually house their second wives along Concubine Lane across the street. Today's Concubine Lane, along with the neighbouring Jalan Panglima and Market Lane, is just as colourful, but in a very different way. Shops sell kitschy snacks such as rainbow cheese toast - stringy cheese in multi-coloured hues on toast; adults squat on wooden stools at Concubine Lane Tau Fu Fa, tucking into bowls of soya bean curd topped with ginger syrup; while children savour their melting rainbow-coloured ice balls. There is art to photograph, and art to buy. Artist Yong Wai Yeen paints street scenes of coffee shops and heritage buildings and his live demonstrations are as much an attraction as the artwork he sells. At one end of the street, tourists cluster around an installation of multi-coloured umbrellas hanging overhead, seeking a bit of shade - and a photo for their Instagram stories. There is more food available in Ipoh than there are meals in a day to try them. So order a variety to share at Kedai Kopi Kin Kok, including seafood char kway teow topped with a fried egg and a bowl of curry noodles. The char kway teow is similar to the Penang version, although the kway teow is fatter and smoother; the seafood is generous and the cockles daringly undercooked. Meanwhile, I top off my curry noodles with a piece of bitter gourd yong tau fu, stuffed with minced meat in the Hakka style. The bitterness is welcome foil to the richness of the curry, and a garnish of mint leaves adds a refreshing lift to the fiery orange soup. Late afternoon is the best time to check out Ipoh's murals, when the sun is a bit more forgiving, and the light a bit gentler for photographs. Lithuanian-born artist Ernest Zacharevic, known for his iconic Penang murals such as Kids on a Bicycle and Boy on a Motorcycle, is also behind some of Ipoh's street art. Kopi Break and Old Uncle Drinking Coffee reference the white coffee Ipoh is famous for, while tin miners at work are depicted round the corner from Han Chin Pet Soo museum. There are other paintings too, by local artists such as Eric Lai, whose paintings of an Indian man carrying a kavadi, Chinese opera performers and a wayang kulit troupe adorn an alley between Jalan Sultan Iskandar and Jalan Masjid. For now there are no queues to photograph these paintings, which are spread out enough so your self-guided art walk never feels congested. Moonlight hor fun, also known as yu kong hor, is another Ipoh specialty - kway teow stir fried and topped with a raw egg (the "moon"). Two restaurants well known for this dish are both located on Jalan Yau Tet Shin - Restaurant Sun Tuck Kee, and Restoran Tuck Kee. Both stalls' versions are moist and flavourful, although the former also serves a punchy belachan to accompany the dish. In the spirit of comparison, I also order the baby octopus in soy sauce at both stalls, which is cooked perfectly - crunchy yet tender. Check into boutique hotel Sarang Paloh Heritage Stay, which is located in a shophouse formerly owned by Yick Woh pawn shop. The hotel has maintained the building's original timber floors and high ceilings, and decorated rooms with restored wooden furniture. It is less than five minutes on foot from Ipoh's old town, the staff greet my partner and I by name every morning and at RM268 (S$90) per night, it is a steal. Start your day with a cup of white coffee, which is coffee made from beans that have been roasted with margarine for a milder, caramelized flavour. 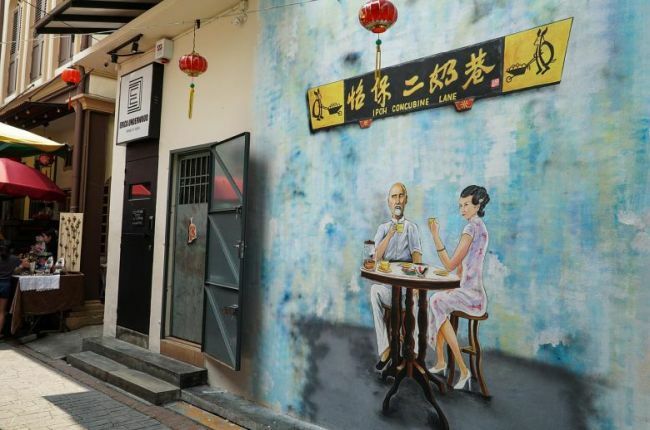 The Lonely-Planet listed Sin Yoon Loong as one of Ipoh's most well known coffee shops, but lawyer Mr Lai Kok Cheow, who works nearby and comes by for coffee every day, says any of the coffee shops along the same street are just as good. Most patrons at Sin Yoon Loong order the same thing - a pair of soft boiled eggs on buttered toast, a plate of wanton and char siew noodles, hot coffee, and a serving of wobbly custard to end the meal. It may seem like a lot for your first meal, but you'll need the energy for the rest of the day. Head out of the city to explore Ipoh's cave temples, sprawling temple complexes carved out of limestone. There are about seven cave temples near Ipoh with statues of various Taoist and Hindu deities, including the Goddess of Mercy and Lord Ganesha. Sam Poh Tong, which is backdropped by towering cliffs, is the most well known, but Perak Cave Temple has a more impressive view. A lung-busting 450-step climb takes you to a view of Ipoh's suburbs, and limestone mountains in the distance. The cave temple's arcing walls also depict colourful paintings of Chinese deities, dragons and phoenixes. While the temples have been carefully hollowed out and decorated, the cavernous Gua Tempurung is all natural. There are four packages available to explore the cave system, ranging from a 40-minute walk to a three-and-a-half hour spelunking expedition that involves sliding down slopes, crawling through caves and wading through an underground river. The weather forecast predicts rain on the day I visit, so the river expeditions are closed because there is a risk that water will flood the caves leading to the exit. Instead, I explore the cave on foot, climbing long flights of stairs past a gallery of stalagmites and stalactites. At some points the cave narrows so I can run my fingers along the gently curved walls, at others, it expands into massive caverns where light reflects off the sides in orange and purple hues. Spend the rest of the day in Ipoh recharging from the morning's exertions. Many cafes are helpfully clustered around Sekeping Kong Heng, a boutique hotel in the old town. Stop by the industrial-sleek Plan B, and the artfully shabby Burps and Giggles, which both serve cafe staples such as burgers, avocado toast and salmon bagels. Leave room for dessert at Patisserie BoutiQue - the inventive menu includes a chicken floss salted egg cheesecake, an oreo matcha mousse cake and a burnt cheesecake with a deliciously caramelised crust. It is a sweet way to end a meal and a weekend. Airlines such as Air Asia and Scoot fly to Ipoh in about one hour and fifteen minutes. Alternatively, Ipoh is about one hour and forty five minutes from Penang via Malaysia's Electric Train Service. SIM cards are not sold at Ipoh's airport, but you can get one at a mall such as Ipoh Parade. MAXIS, DIGI and CELCOM are all reliable service providers. Get around by Grab, which is affordable and easy to book. Short hops around the city centre cost about RM5 to 8 (S$1.64 to 2.63), while a 20-minute ride to Gua Tempurung cave costs about RM35 to 40. If you are heading out to the cave temples or Gua Tempurung, consider arranging a return trip with your driver as it is more difficult to book a Grab from there. If you have a bit more time, consider taking a day trip to Taiping, which is about 45 minutes from Ipoh via train. The even-smaller town is known for its lake gardens, mangrove tours and affordable seafood restaurants by the sea.